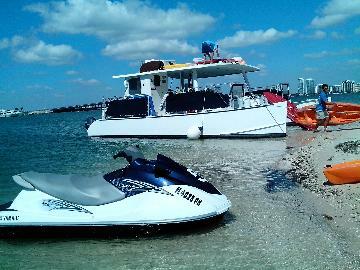 We take a 40 foot catamaran to an island or sand bar about 30 min away with up to 32 people for a very fun day. Upon arrival the Captian and Crew unloads the water toys which you may use at no charge. Call 786-529-7787 for info on how to set up groups of 6 or more. Trip Takes place from 230 to 530 daily included use of the above and have FREE sodas and snacks. We are Soft Sided Cooler Friendly NO GLASS!! You can bring your lunch and some of your own snacks. We want you to be as comfortable as possible on our trip.